Welcome to Vernon and the sunny North Okanagan, where our casual lifestyle matched with spectacular outdoor recreation opportunities has led Vernon to become one of the most diversified communities in BC. The community is surrounded by three lakes; Okanagan, Kalamalka and Swan in British Columbia’s Okanagan Valley, one of the most desirable regions in Canada in which to live. The community is located approximately 4 1/2 hours by car from Vancouver and the Pacific Ocean, and 3 hours north of the US border at Washington State. Vernon is the hub of the North Okanagan and has a population of over 42,000. Vernon is surrounded by several small communities including Coldstream, Armstrong, Spallumcheen, Enderby and Lumby. These communities, along with several unincorporated areas, are part of the Regional District of North Okanagan. The Okanagan Valley region as a whole, has a population of over 360,000. The area is known for its long warm summers and mild winter climate. Vernon provides an exceptional quality of life with a mix of urban amenities, world class resorts, amazing recreational opportunities all situated in a natural setting. 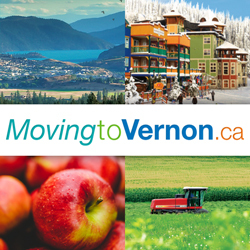 Vernon is a great place to live, work, visit or invest. Just ask anyone who lives in the region. These pages have been created to help provide an overview for those that are looking at moving to the area.